"The result of ancient magical experimentation (poorly conducted experimentation, I am sure) goblins [ orcs ] only vaguely resemble the men from whom their forebears sprang. Although some attempt has been made to civilize them, surliness still dominates their nature." 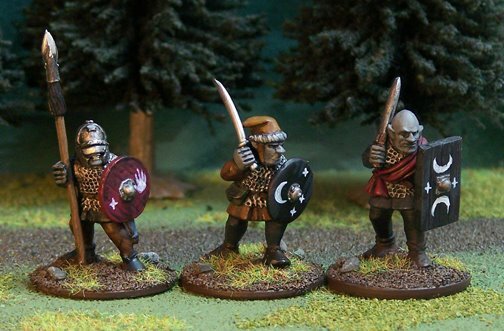 The six orcs above come from Vendel Miniatures (now sold by SGMM). I used my window sill studio to take this shot, augmented with a desk light. Usually, I paint the eyes, but for these I just used a black wash (watered-down acrylic) to fill in the recesses in the face. 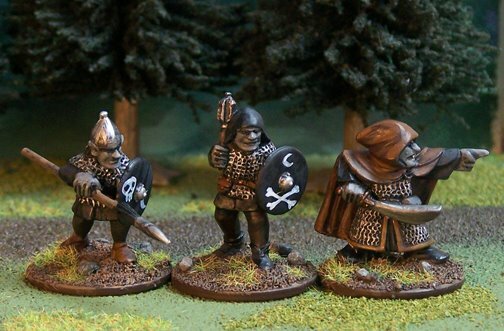 Goblins, of course, have been a part of European folk lore for hundreds of years. J.R.R. Tolkein was the one who first popularized the term, "orc." It is thought that the word was ultimately derived from, orcus, Latin for "hell." Here's a well cited article discussing the etymology of the word on Wikipedia.